The privacy of our visitors to artificialdiscreplacement.com is important to us. At artificialdiscreplacement.com, we recognize that privacy of your personal information is important. Here is information on what types of personal information we receive and collect when you use and visit artificialdiscreplacement.com, and how we safeguard your information. We never sell your personal information to third parties. To Fuse or Not to Fuse? This is the question! Spinal Fusion, Disc Replacement or another option? We can help you understand your options, from spinal fusion alternatives to disc replacement options? In the last decades medical technology has moved forward at a faster than ever pace. Yet many spine surgeons remain stuck in the past, limited by regulation they are still using fusion surgery or outdated disc replacement technology. Are you asking Disc Replacement versus Fusion Surgery? Due to FDA restrictions, limitations of the approved products, and the inexperience of many surgeons, many patients will be exposed to unnecessary risk, get debilitating fusion surgery, or continue to suffer needlessly. Most, never knowing there are better options available, technology that can preserve the natural motion of the spine, and surgeons with the experience required to help them. Why Disc Replacement versus fusion surgery? There are several concerns with spinal fusion surgery. Overall success rates are very low and the recovery is long and painful. Even after a "successful" spinal fusion, problems begin to develop soon after the fusion surgery. The segments next to the Fusion Surgery have more forces applied causing "adjacent level degeneration" which studies have shown will lead to additional pain and surgeries. 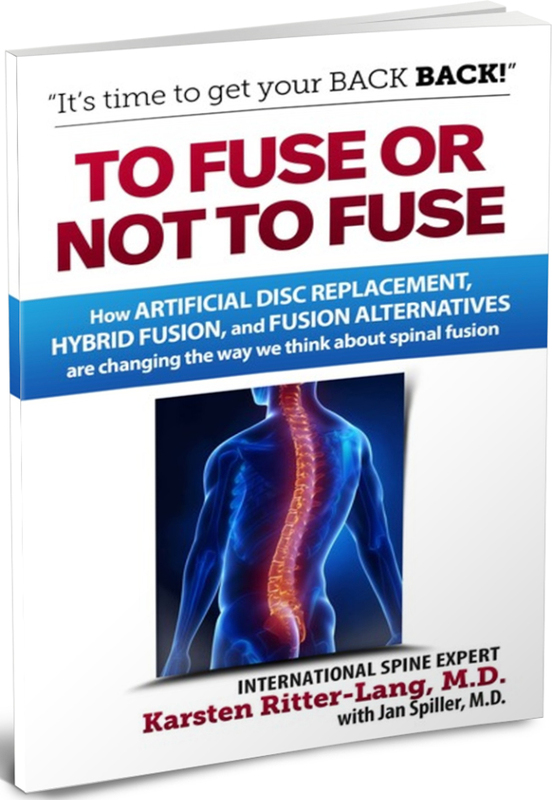 In this new book Spine Surgeon Dr. Ritte-Lang explains how Artificial Disc Replacement, Hybrid surgeries that may include multiple types of intervention, and Fusion Surgery Alternatives are changing the way we think about the "Gold Standard" Spinal Fusion Surgery. Click here to get your Free book now! Spinal fusion surgeries are on the rise. In fact, spinal fusions are now the most common spinal surgery by far! What once was a surgery of last resort is now performed over 400,000 times a year in the U.S. alone! How Post Fusion Surgery Adjacent Segment Degeneration causes many fusion recipients to require more and more fusion surgery! How Artificial Disc Replacement and hybrid interventions are helping patients get their lives back! How patients are trading multi-level fusion for multi-level disc replacement surgery! Why skiing, surfing, golf, horseback riding and even Ironman Traithlons are no longer a thing of the past for those who have suffered severe back pain! It's time to get your back BACK! Karsten Ritter-Lang, M.D., is a world-renowned leader in reconstructive spine surgery. Dr. Ritter-Lang worked and taught at the Charite University Hospital, widely recognized as the birthplace of the first effective artificial disc replacement. Dr. Ritter-Lang has been a specialist in the field of intervertebral disc prosthetics for over 20 years. He has performed approximately 7,000 surgeries, over 4,000 of which have involved artificial disc replacement. He has also performed several thousand spinal fusion surgeries and hundreds of hybrid interventions in his ongoing career. His participation in the ongoing development of intervertebral disc replacement technology, prototypes, and implants makes him a valuable resource for other spine surgeons, who travel from around the world to observe and model his surgical techniques. BEFORE WE CAN talk about spinal disorders and potential surgeries to treat these disorders, it will be helpful to take a quick look at the spine. If you are already familiar with the structure and function of the spine, feel free to skip ahead to the next section. These intervertebral discs are wonderful structures that allow the spine to move in wonderful ways. These discs also help protect the vertebrae from each other, keeping them from wearing against each other. And because of the stresses and motion that these discs must endure for a lifetime, they often get injured as well. The human spine gives strength and form to our bodies and is responsible for our ability to stand and walk with an upright posture. It is divided into three sections: cervical, thoracic and lumbar. The spine consists of 24 vertebrae that are connected to one another by intervertebral discs (we will just call them “discs” from this point), facet joints (joints formed from protrusions on the vertebrae) and the various ligaments; together they form a strong but flexible structure. The cervical and lumbar spine are exceptionally mobile. The thoracic spine in conjunction with the ribs forms an almost completely rigid “cage” to ensure the function of the lungs, heart and other organs. In addition to providing strength and structure to the core of the human body, the spine also protects the spinal cord, which runs through the spinal column. The spine and its components form the major “axis organ” of the body, and all other organs depend on the spine in one way or another. Likewise, the spine can only perform its function with an intact muscular system. To understand the disc, you need to first understand the vertebrae. The vertebrae are the bones in your spine. They are what gives strength and structure to your body. Each of the 24 vertebrae in a spine are unique. Though no two are quite the same, they do share common structures and function. The vertebrae in the thoracic spine allow very limited mobility. Instead, with the ribs, they provide a mostly rigid upper core that supports and protects your lungs, heart, and other critical organs. Because of this relatively rigid structure, the thoracic vertebrae tend to bear stresses together, with very limited force borne by an individual vertebra. As such, we see far fewer thoracic spine injuries and degeneration than we do in other areas of the spine. The cervical and lumbar spine are another story. The vertebrae in a healthy cervical spine and lumbar spine allow significant motion. Barring injury, their form allows you to bend down and touch your toes, and to bend your neck to put your chin on your chest. As you may have experienced if you have back problems yourself, any compromise in motion in these areas can result in serious limitations and pain. The high level of mobility in the lumbar and cervical spine comes at a cost; these areas are far more prone to injury and degeneration than the thoracic spine. The relative freedom of movement means a single lumbar or cervical vertebra can be subjected to much greater stress than a thoracic vertebra. The additional movement also causes these areas of the spine to wear out at an earlier age as a result of degenerative processes. For this reason, lumbar and cervical spine injuries are very common. Unfortunately, because the spinal column also surrounds and protects the spinal cord from injury, changes to the segments of the spine can also impact the spinal nerves structures and cause excruciating pain and other symptoms. In between the vertebrae are soft, flexible discs that serve to separate the vertebrae and allow them to move in relation to each other. These are called intervertebral discs for the simple reason that they sit between the vertebrae. For simplicity, they are often referred to merely as discs. The exterior of each disc is composed of a fibrous material called the annulus fibrosis. This surrounds and protects the soft fluid-filled center, the nucleus pulposus. While the names of these structures are not important, their function is very important. You see, this combination of a soft center and a strong but flexible exterior allows the spine to move in six distinct ways. Learn More about the wonderful new Disc Replacement Implants that allows the spine to move in all six distinct ways! understanding spinal conditions and treatments. All Data submitted will be protected and transmitted to ENANDE GmbH only.